The strategy for boosting ranking and down-the-line sales via high volume distribution of Kindle books is widely known. It’s also widely known that it can be a nightmare to plan your online promos. Many sites require long lead times, have varied and complicated submission forms and are fussy about genre and content. Also, (with regards to promoting freebies) since Amazon Associates’ clampdown on free promos with their affiliates in 2013, many sites have restricted the amount of promos they allow, and many have even stopped running them altogether. For maximum impact it’s certainly still advisable that you try to get featured on as many other free listing sites as possible. 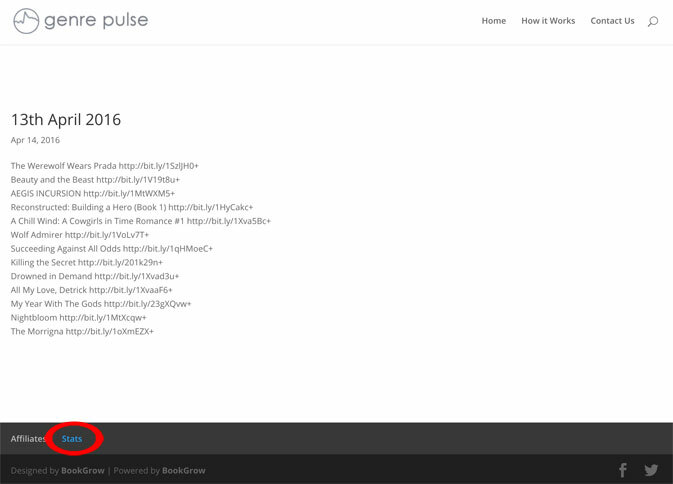 Genre Pulse simply offers a surefire way of generating downloads / sales. It is a powerful book marketing tool to have in your arsenal. Whether you are running a $0.99 Kindle book (perhaps countdown deal? ), free KDP Select promo, or if you’ve managed to create a ‘PermaFree’ listing, Genre Pulse will be happy to run your promotion for you. When we launch a ‘genre specific campaign’, your book will be sent via a custom mailshot (as above) to those of our readers who are specifically interested in the genre you wish to target. Genre specific targeting has a high open-to-click conversion rate as it is obviously very well targeted. We will also syndicate your campaign to our app users. Clicking View Packages will take you to a choice of our targetable genres. Within each genre page there is a calendar and form where you can fill in your details and book your slot. Bookings are paid for in advance via PayPal integration. All campaign clicks are tracked via Bit.ly and stats are accessible by clicking on the ‘stats’ link on the footer of this site. Please make sure you enter all your information correctly as it is difficult to make changes once a campaign is booked. Please don’t book any of the packages at the same time for the same campaign as they will obviously overlap. Repeat bookings are permitted for the same books. Just please make sure you leave at least a week between repeat bookings as we don’t want to overload our audience with the same content.